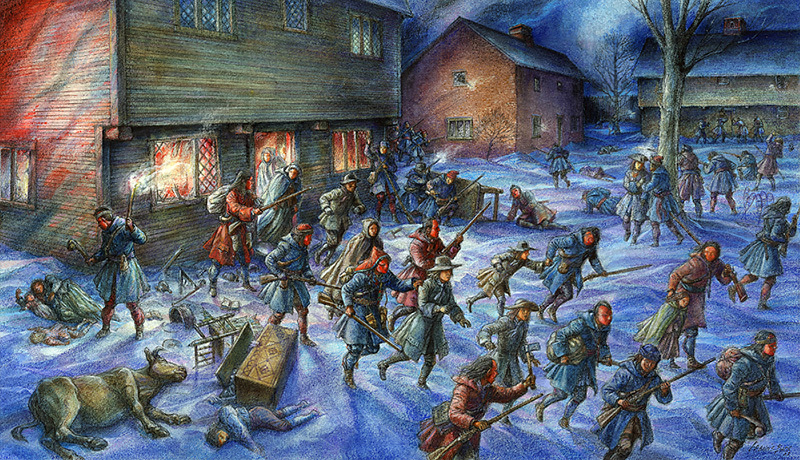 The pre-dawn raid on Deerfield, Massachusetts in February, 1704. Illustration by Francis Back. During a memorable three-hour span in the early 1700s, the town of Deerfield, Massachusetts, stood at the center of the struggle to control the North American continent. To travel back in time early on the morning of February 29, 1704 would be to encounter the flicker of flames and smell of smoke and gun powder; the air would be filled with a cacophony of French, English, and Native voices mixed with battle sounds, cries of despair, and cries of triumph. French, English, Indians, Africans, men, women, children, soldiers, ministers, farmers, and traders….all were there on that fateful day. By mid-day over 70 residents and attackers were dead; while 112 men, women, and children were being hurried out of the burning village by their French and Native captors. The 1704 Raid on Deerfield is a doorway to a fascinating and important part of American history. It was an event rooted in religious conflicts, personal and family retribution, alliance and kinship ties. The Raid on Deerfield and the colonial world that produced it, helped to create a distinctive American identity and world view that became a backdrop for the American Revolution. The Raid on Deerfield in 1704 was an important episode in Queen Anne’s War (1702-1713), part of a global contest as England and France vied for control of the Spanish crown and its empire. It was a significant event for British colonists and for Native communities who had long called this region their home. As such, the Raid provides educators a valuable opportunity to explore global issues while also offering a compelling entry point for teaching the complexities of the early American colonial period and the many cultural groups who comprised it –Native nations, enslaved African Americans, the French and English settlers. Economic, political, and religious competition and cooperation played key roles in the colonization of North America. It was an era of shifting alliances as well as conflicts, ranging from trade disputes, to raids and the taking of captives, to whole-scale war and policies of extermination. It was through the experiences of living on the edge of empire that Americans forged a distinct identity that would play an important part in their decision to found their own unique nation. What does this site and event teach us about the complexities of the American colonial period? How did Deerfield, a community at the edge of the English Empire, become the epicenter of international conflict at the turn of the 18th century? What were the histories and experiences of Native Nations and peoples in this region? How does this colonial history help us to understand the origins of the American Revolution? Who “owns” history? How can we identify, understand, and incorporate multiple perspectives of cultural groups and individuals in historical narratives? How can educators teach unsettling or “hard history” to children?